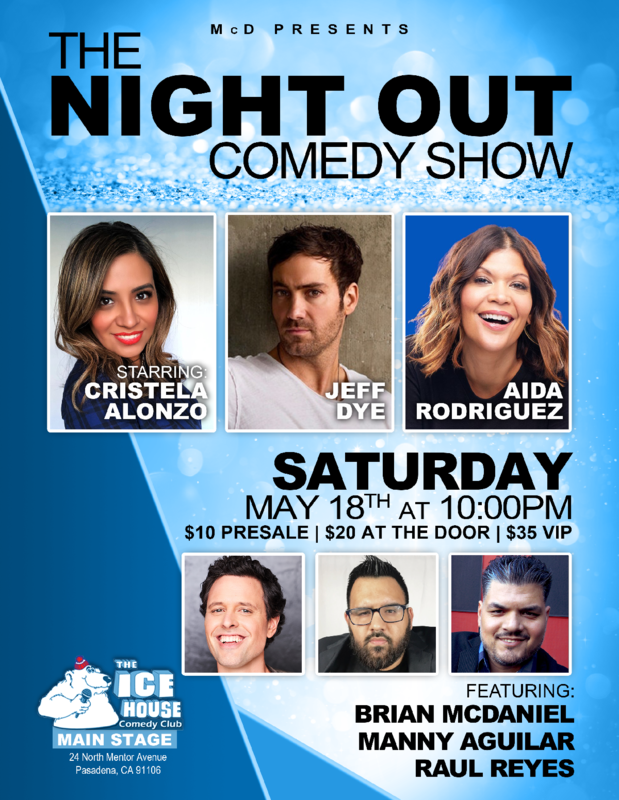 The Ice House :: The Night Out Comedy Show with Cristela Alonzo, Jeff Dye, Aida Rodriguez and more! The Night Out Comedy Show with Cristela Alonzo, Jeff Dye, Aida Rodriguez and more! Get Your Tickets Now! - $10 pre-sale general admission or $20 at the door! Cristela Alonzo is the cocreator, coexecutive producer and star of the ABC sitcom, “Cristela,” an achievement which caps a whirlwind year. Cristela rose to fame in the world of standup and has since topped multiple comedy power player lists including "Variety's Top 10 Comics to Watch," "Top 10 Comedy Acts to Watch in 2014" by LA Weekly, Cosmo Latina's "8 Women You Should be Following on Twitter," Time Out's "Comics to Watch," Cosmo's "13 Female Comedians to Watch For in 2014," and "One of the 50 Comedians You Should and WILL Know" by Vulture.com. Cristela recently made a deal with Comedy Central to release her debut CD, “Some of the Hits,” this fall. "The Half Hour," her first half hour special in Boston, premiered in June 2013 on Comedy Central to rave reviews. Cristela has also made appearances on “The View,” “The Late Show with David Letterman,” "Conan,” Gabriel Iglesias' "Stand Up Revolution," Showtime's "Legally Brown," "Last Comic Standing" and "Live at Gotham." In addition, she performed at the Bonnaroo Music Festival and the Just for Laughs Festival in Montreal. One of the most popular standup comedians in the college market, she showcased at the NACA (National Association of Campus Activities) national convention in Charlotte, NC, and was the most requested act of the convention. In the past three years, she has performed for almost 300 colleges. Originally from San Juan, Texas—Cristela is based in Los Angeles, and when not on the road, can be found performing at various area clubs, including her home club The Comedy and Magic Club in Hermosa Beach. Jeff Dye: Jeff Dye is a nationally touring comedian, actor, host, prankster and Bigfoot enthusiast. He stars in NBC's new comedy adventure series Better Late Than Never. This exciting project follows the travels of Henry Winkler, William Shatner, Terry Bradshaw and George Foreman as Jeff creates for them the adventure of a lifetime. NBC has fast tracked season two after the show became a summer smash hit! Dye has performed on The Tonight Show Starring Jimmy Fallon, finished 3rd on Last Comic Standing and has had his own Comedy Central Presents special. In previous years he has starred on numerous TV projects, including Money from Strangers, Girl Code, Extreme Makeover: Home Edition, as well as NBC's I Can Do That - a one-hour comedy variety series that puts six of America's brightest entertainers to the test as they compete to showcase their talents with breathtaking and unique acts, featuring skills they didn't even know they had. Jeff's latest album Live from Madison is exclusively playing on Sirius XM and is now available in wide release.